Hailing from Brazil is this charming multi-terminated watermelon tourmaline crystal with a tiny rider crystal at its' side. Thought to help metaphysically with issues of the heart and its' health on all levels, this sweetie's a great contender for your affection! 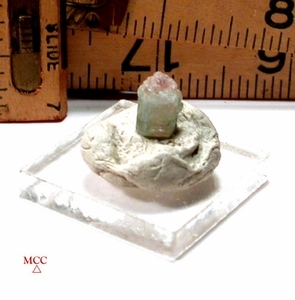 1/4x 5/16x 3/8" tall, it stands safely to greet you...and could be a lovely small pendant, too.